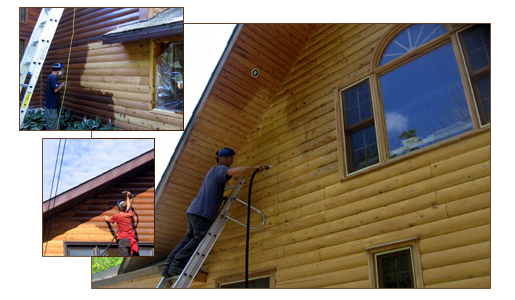 Atlantic Log Home Refinishing was founded in 1984. It is a family run company. We take pride in what we do and it is our intent to provide the customer with a service and experience that we ourselves would want. Our friendly staff is job friendly respecting the privacy and security of our customers. We are fully insured and are very safety conscious. We are currently expanding our territory and now take in all the Maritimes. Miramichi has one of the world’s greatest salmon river runs where we live and the beauty of the river is second to none. We feel proud to be a part of this community with pride in our work and river. My wife and I have worked together hand in hand in business for some 25 years and feel we can be proud of what we have done and continue doing. We hope to get the opportunity to show you our work ethic and quality of work in this amazing business. By Refinishing homes we remove the old stain and paint and open the pores of the wood to accept new stain. Many homes have been stained over the years after the logs have been milled and in the process of milling the pitch is brought to the surface of the log and this does not allow for stain to penetrate into the wood so naturally the stain with our winters and heat from summer starts to lift and peel. We make sure that the logs are ready to receive stain and with our maintenance program the life of the home or stains can be prolonged; in time it saves you money.